Discover how you can grow your business and save with an eBay Store subscription. Choose from three subscription packages with fixed price insertion fees as low as 5¢, free pictures, and features designed to boost your success through every stage of business growth. To become an eBay Store subscriber, confirm that your contact information is accurate, have a credit card on file, and verify your PayPal account. Choose your eBay Store subscription. Select the subscription level that fits your needs. Compare the options to help decide which subscription is right for you. Start enjoying your exclusive benefits. Get the most out of your subscription. Design your Store’s home page, order your free eBay-branded shipping supplies, and more. To help you choose a subscription, consider the volume of listings and sales you make each month, the price your items sell for, and the main categories you sell in. If you're not sure which Store subscription level might be best for your business, start with the recommendations below. A single, branded place on eBay where all your listings live. Get your own URL (stores.ebay.ca/yourstorename) to drive buyers directly to your store. Promote 4 featured items on your Store homepage. Help buyers browse your Store with up to 300 custom categories. Add a billboard, logo, and description to express your brand. Take advantage of partner discounts on select services. Valuable free tools to help you save time, improve customer satisfaction, and scale your business. Attract more buyers by offering discounted pricing on your items. Put your listings on hold while you're away. A link to your eBay Store will appear on all your listings. Add your Store header, search box, and category navigation to all of your listings in your item description. Easily create links to your Store from emails, other websites, and listings. Keep your customers coming back with customized e-newsletters and promotional emails. Create promotional flyers and include them with your shipments to drive repeat business. Boost your brand and establish a professional image with these downloadable templates. Optimize your Store for search engines and increase your exposure on the web. Building a brand helps make your Store stand out in the crowd, giving it a professional and recognizable look, while ensuring that your customers remember their shopping experience with you. Add a photo that promotes your brand, products, or a limited-time promotion. A graphic symbol that embodies your brand and can be easily recognized by your customers. Allows buyers to search for items within your Store. Interested buyers can get the latest updates when they subscribe to your email newsletters. Keep customers coming back. When members follow you, your items appear in their home page feed. Easily promote your Store on Facebook, YouTube, Pinterest, Twitter, and email. Tell buyers about your store using keywords that clearly describe your Store and items. Showcase select inventory from listings ending soonest, newly listed, or hand-picked by you. Use up to 300 custom categories to organize and display your items. Show off items you want to feature. You can learn more about customizing your Store on our help page. If you've already chosen a Store name, you can update it to better reflect what you sell. You can update your Store's description at any time by going to My eBay > Manage My Store > Display Settings. Custom pages are a set of unique pages you can create for your Store to help showcase items, feature promotions, or host background information for your business. Using custom pages can help increase your standing in search engine rankings, as they offer more opportunities to use valuable keywords. You can manage your custom pages from My eBay > Manage My Store > Custom Pages. You can manage your custom categories from My eBay > Manage My Store > Store Categories, or learn more about managing Store categories on our help page. Store owners can link up to five Store categories in their listing header. Make sure you use a listing frame that shows listing headers on your listings, and use it to link to your most important Store pages. You can manage your listing header from My eBay > Manage My Store > Listing Template. Perhaps the most straightforward way to increase the chances of buyers finding your Store in search results is to customize the keywords associated with your Store. Add primary and secondary keywords—eBay will use these keywords to automatically create page titles and meta tags for your Store. You can add or edit the search engine keywords for your Store from My eBay > Manage My Store > Search Engine Keywords. Once you’ve subscribed, your active listings will automatically appear in your Store—but it’s up to you how they are organized. Think of your eBay Store as a physical store: the more attractive the presentation of your items, the more likely it is that buyers will visit and make a purchase. You can organize your items within custom Store categories, select items to feature, put items on sale, and set your Store to holiday mode. Simply go to Manage My Store in My eBay to start managing your Store. Make it easier for customers to navigate your Store and find items be using your own category structure. You can create up to 300 categories with up to 3 levels—e.g. Sporting Goods > Golf > Balls. 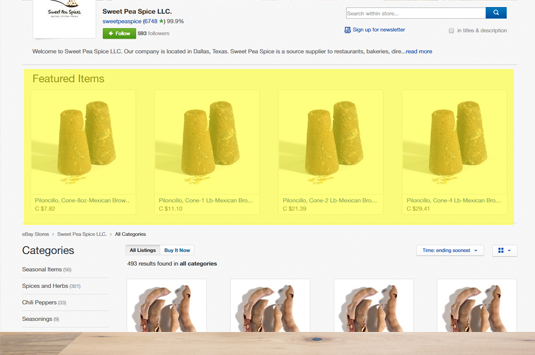 Your categories can be unique—they don’t have to match eBay’s category structure. Organize your listings according to brand, type, or price. 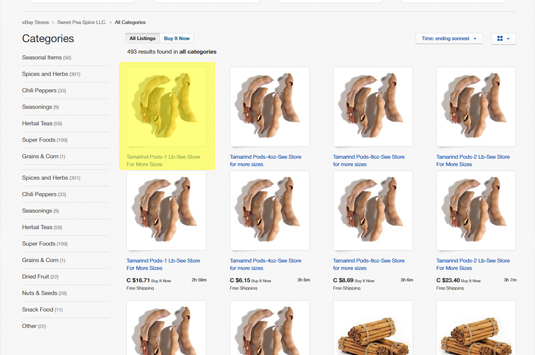 Create special categories to attract attention, such as "New arrivals" or "Clearance". List items in two Store categories at once, at no extra charge. Add, edit, move, and rename Store categories at any time. Showcase products in your Store by using featured listings. These items are displayed with bigger photos, giving them prominence on the page. You can also set your Store to automatically feature items that are ending soon, or set to feature your newest listings. Simply select Edit Store, and then Featured Listings in Manage My Store. Having a sale is a great way to move inventory. Hold a seasonal sale, a category-specific sale, or a clearance sale. You can create different types of discounts through Markdown Manager. You’ll find all the tools you need to manage Store promotions in the Marketing Tools section of Manage My Store. Your listings will include a message to let buyers know you’re on holiday. Your fixed price listings can be hidden while you’re away. A default or custom message will be displayed on your Store’s homepage. To turn on your Store’s holiday settings, go to your Messages and select Change Settings on the top right side of the page. You can also turn on an out-of-office response to let people who contact you know that you’re away. Holiday settings remain on until you turn them off, so be sure to update your settings when you return. Important: You’ll continue to be charged regular fees, such as your Store subscription fee and any listing-related fees, while on holiday. Learn more about managing your Store categories, or start managing them now. Learn more about the tools and plugins you can use to connect your website with your eBay Store. When you subscribe to an eBay Store, you gain access to exclusive tools to help promote your products both on and off eBay. In addition to personalizing your Store and promoting it on social media , you can also create email marketing campaigns to target customers and drive traffic to your store. 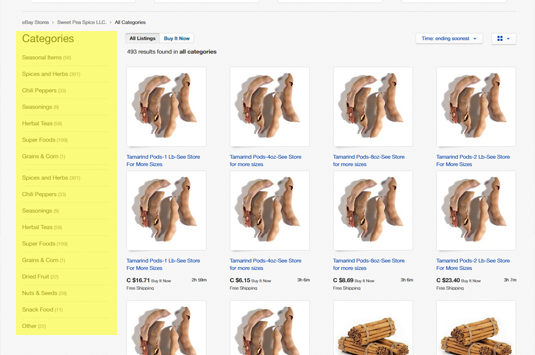 You can also help improve your Store’s search engine ranking by customizing search engine keywords in Manage My Store. Ready to get your Store up and running? Follow these steps to complete the tasks necessary to get your products online and in front of potential buyers today. Choose a subscription level. Use our fee illustrator to help decide which subscription is right for you. Create a Store name and update your username. Consider changing your username to match your Store name to make it more memorable. Learn how. Build your Store categories. 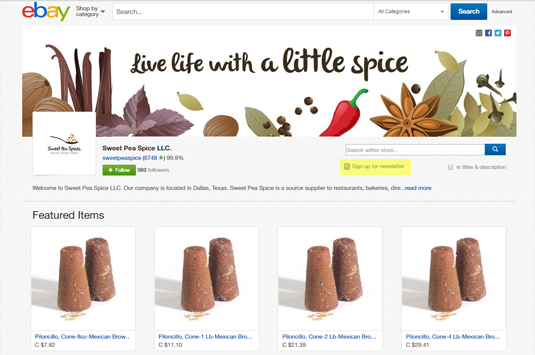 Create custom categories that will appeal to your buyers and make it easier for them to browse your merchandise. Learn how. Create your Store logo. If you already have a company logo, create a 150 x 150 pixel image to upload to your Store. If you don’t have a logo, consider having one designed to give a professional look to all of your channels. Create your Store billboard. Adding a billboard image is an optional but great way to promote your brand, products, and Store events. Select four featured items. Featured items appear near the top of your Stores page and are a great way to highlight inventory. Select four items to feature when you open your Store—consider running a "grand opening" sale to kick things off. Promote your Store. Set up sales-boosting offers using Markdown Manager and create a marketing newsletter for customers to subscribe to. Track and analyze your Store sales and traffic. With Sales Report Plus, a free reporting add-on for eBay Store Subscribers, you can review your sales over time and by category and format, as well as page views and traffic history. Learn how to subscribe. As announced in the 2018 Spring Seller Update, in May 2018, we began to update some eBay Stores to provide a new look that's more secure and more consistent with the look and feel of the rest of the eBay site. The newly-designed experience is free of active content, and complies with the highest browser security standard. It also improves search engine optimization (SEO), enhances the mobile web experience, and provides new merchandising opportunities for eBay Store subscribers. If your Store does not have custom pages or a fully custom storefront, you do not need to take any action. If you have custom pages or a fully custom storefront, for the time being, there will be no change to your Store experience. Visit the eBay Stores FAQ page for frequently asked questions about the new eBay Stores shopping experience. * Exclusions: Pay no Insertion Fees for allotted free listings per calendar month. Optional fees, including advanced listing upgrades and supplemental service fees, and final value fees may still apply. Motor Vehicles, Real Estate, Heavy Equipment, Concession Trailers & Carts, Imaging & Aesthetics Equipment, and Commercial Printing Presses are excluded. Terms are subject to change. Learn more. Up to 12 pictures per listing are free. ** Motor Vehicles, Real Estate, Heavy Equipment, Concession Trailers & Carts, Imaging & Aesthetics Equipment and Commercial Printing Presses are excluded. Terms are subject to change. Learn more. † Pay no insertion fees for allotted free listings per calendar month. Optional fees, including advanced listing upgrades and supplemental service fees, and final value fees still apply. Read frequently asked questions about eBay Stores.